Camellia japonica, also known as Japanese Camellia, belongs in the family Theaceae. Native to Japan, China, Malaysia and India, this hearty bloomer produces flowers in colors of red, white, pink, lavender, orange and variegated mixes of two. Plants are hardy in United States Department of Agriculture (USDA) hardiness zones 7, 8 and 9. Where you live will determine when the camellia produces flowers. In cooler regions, expect blooms in mid-spring; warmer areas will experience blooms late fall through spring. Camellias are good screening plants and specimens, and grow well under the canopy of larger trees such as magnolias and pines. Choose a planting site large enough to house the mature-sized camellia. Depending on the cultivar, varieties can grow anywhere from 7 to 10 feet tall with a spreading habit of 5 to 10 feet. Camellias are slow growers, but are quite large when mature. Select a planting site in your garden that receives partial sun and shade throughout the day. Camellias will perform best when situated in shade during the hottest parts of the day. 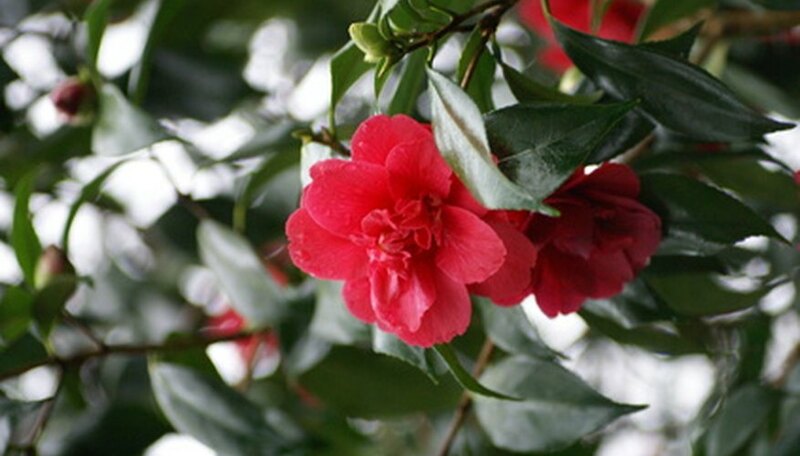 Plant the camellia in an area where the soil drains very well for optimum growth. They will not tolerate consistently wet soil conditions. Remove all the grass, weeds and other vegetation from an area 3 feet in diameter and maintain a weed-free zone as long as the camellia is growing there. Amend the planting site with compost, manure or other organic materials before planting the camellia into the ground. Work the amendment into the top 6 to 8 inche of soil. Camellias prefer growing in well-drained soil that is rich in organic matter. Dig a hole approximately two to three times larger than the camellia’s root ball, and loosen the area’s soil so the roots will properly spread out. Remove the camellia from the container and inspect its roots for any wrapping. If the roots are root-bound, make two to three vertical cuts through the root ball to new root growth. Place the camellia into the planting hole no deeper than it was in its original container. Backfill the hole halfway with soil, tamp down the area and water. Allow the water to settle, then continue adding soil to the remainder of the hole. Firm the soil around the base of the plant. Water the camellia after planting, thoroughly saturating its roots every day for two weeks. Once the plant becomes established, water two to three times per week to keep the area moist but not flooded. Apply a 3- to 4-inch layer of mulch around the planting site to help keep the area moist and cut down on the growth of unwanted vegetation such as weeds. Cut camellia flowers are good to use in flower arrangements as they last for days.